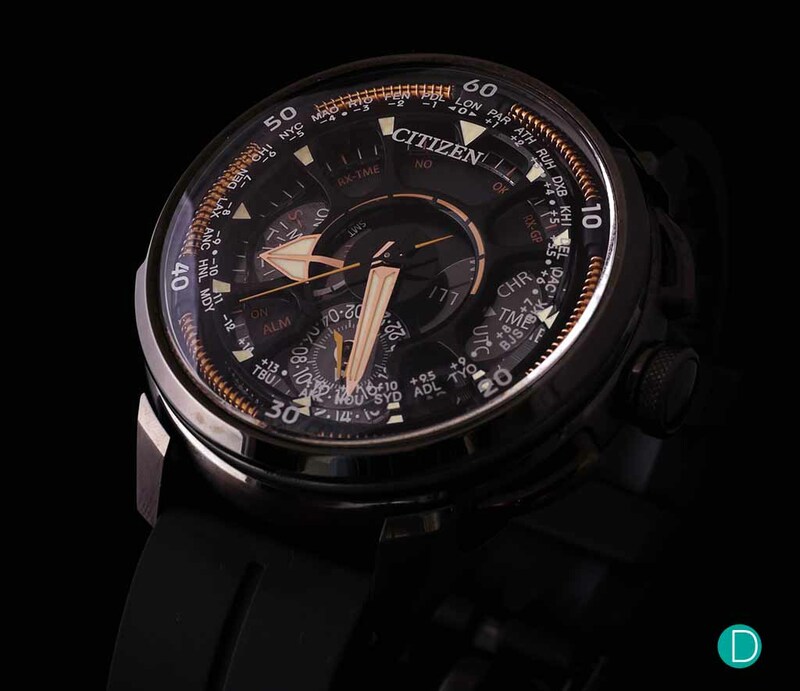 For their 100th Anniversary Celebrations (2018), Citizen launched several watches. 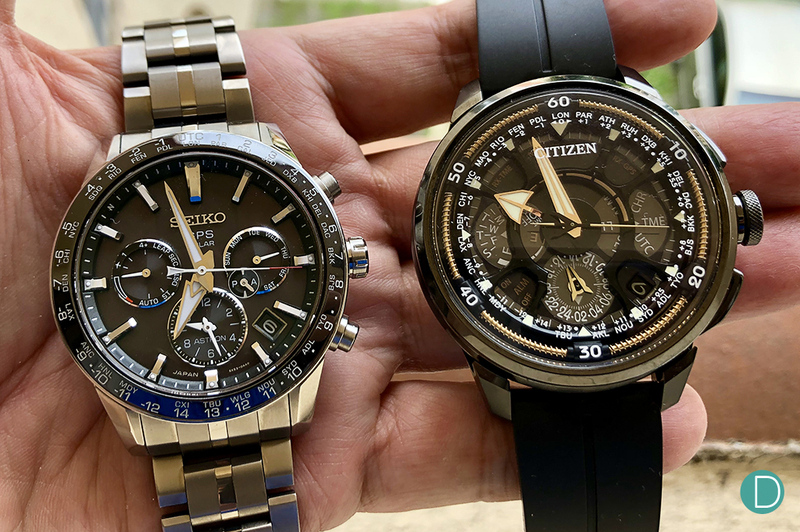 We managed to receive a loaner from Citizen on one of the more interesting pieces – the Satellite Wave GPS Super Titanium 100th Anniversary watch – limited to 1500 pieces. Here is our detailed analytical review. 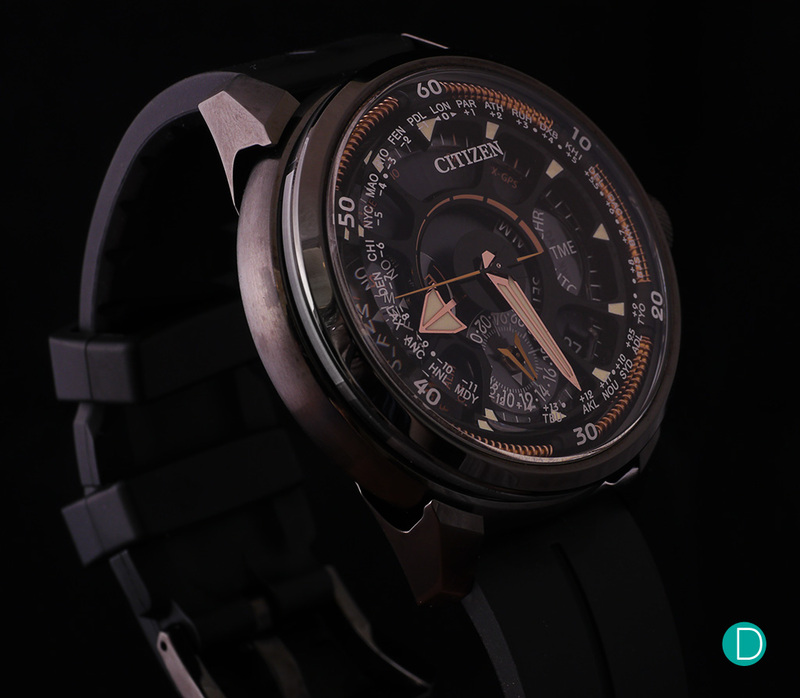 Citizen is a powerhouse of engineering within the watchmaking industry. More so than any other manufacturer. We already waxed lyrical about the Citizen Chronomaster, which we think is perhaps the best quartz watch you can buy right now. We will be delivering a report on our visit to their manufacturing facilities in Ilda Prefecture, Japan soon (watch this space), where their engineering prowess will become evident. Throughout its 100 years of existance, they seem to have focused on the engineering and neglected on the marketing. Well known for making good, reliable, reasonably priced watches that just work, than pure marketing hype. For this review, we look closely at the Citizen CC7005-16G Satellite Wave GPS Super Titanium 100th Anniversary, a long moniker if there ever was one. But look past the long name, and what impresses immediately is the extensive use of proprietary technology. A long list indeed. From their light powered Eco-Drive, to Duratec for the super hard titanium, to the satellite wave, and radio control, the watch is a showcase of Citizen savoir faire. And may seem more like a tech release than a haute horlogerie offering. Of course the Citizen Satellite Wave is not haute horlogerie as defined by the Swiss. There is no pretense of handworked finishing, or traditional watchmaking decoration and techniques. What it is, is a high tech approach to telling time and to providing horology solutions for multi timezone travel, chronograph timekeeping, and alarms. All useful and practical functions for a travel watch. 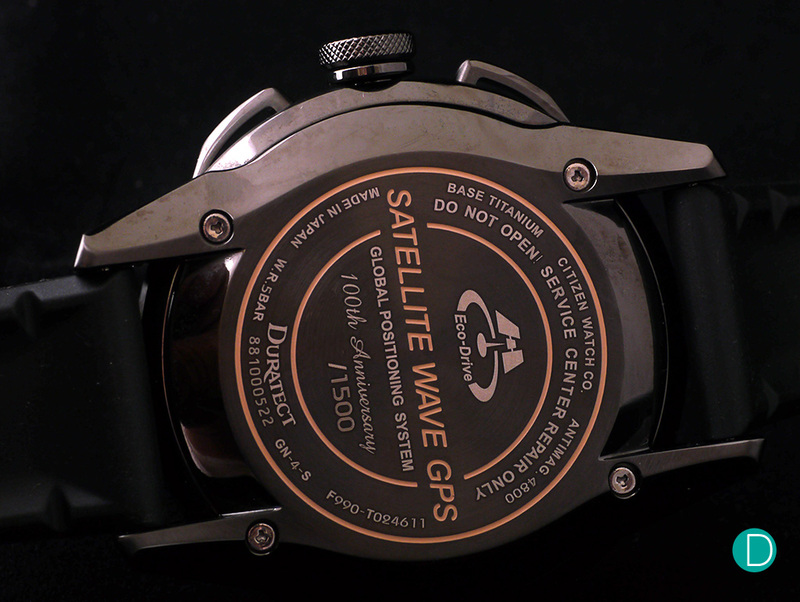 The case of the Satellite Wave F990 is rather massive, measuring 48.5mm in diameter and 18.5mm thick. It bears a good presence on the wrist, but remains totally comfortable at all times. Perhaps due to the design which uses lugs which are angled towards the wrist, hugging it and allowing the watch to sit comfortably. Also due to the Duratec titanium case, which is not only highly scratch resistant, but also super light. Aesthetically, the material has an interesting dark, brooding look. The finish is a juxtaposition of contrasting high polish and matte finished surfaces. The overall aesthetics of the case looks like it was made in a high tech ceramic, though instead it is made of a special ultra hard titanium. The case shape is round with matt finished rounded sides with a small bezel which is chamfered and polished to a high gloss. The lugs are an extension of a plate which forms the case back. The plate is attached by screws at the back of the watch. The lugs extrude from this back plate and seem to be hollow. The shape makes a curve upwards from the back plate towards the front bezel, but do not make contact, nor does it touch the case at any point. As a result, there are gaps between the lugs and the case. Our Tech Elf remarked that it looks like a place to collect dust, but over the period of a month or so when we had the watch with us, it seemed to be free of it. The pushers at 2 and 4 are designed to form a curved look for sleekness, and also skeletonized. We think perhaps the design of both the lug attachment and the hollowed out pushers are aesthetic design treatments, as titanium is already light, and removing material to make the already very light watch only that little bit lighter does not seem to make much sense. The dial layout is very complex. 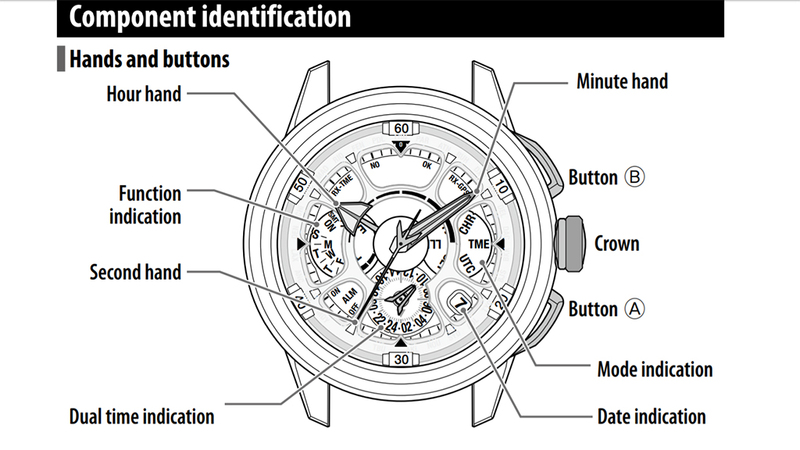 And understandably so, as the watch packs a huge list of functions and features. But we found the layout and operations to be quite easy. We wouldn’t say intuitive, as we needed to read the manual to figure out how to operate the watch, but once we have read the instructions, it is logical and easy to use. And despite the busyness of the dial, it is easy to read the time, due to the very large hour and minute hands. Our only nit pick is the second timezone hands are oddly shaped, and not intuitive to read. Also the hour markers on the second timezone sub-dial are very small, and overlap. Difficult for older eyes, and/or tired jet setting traveler’s eyes. Surrounding the dial is the satellite antennae, which is a nice golden hue, and shown off like a chapter ring on the outer edge of the dial. 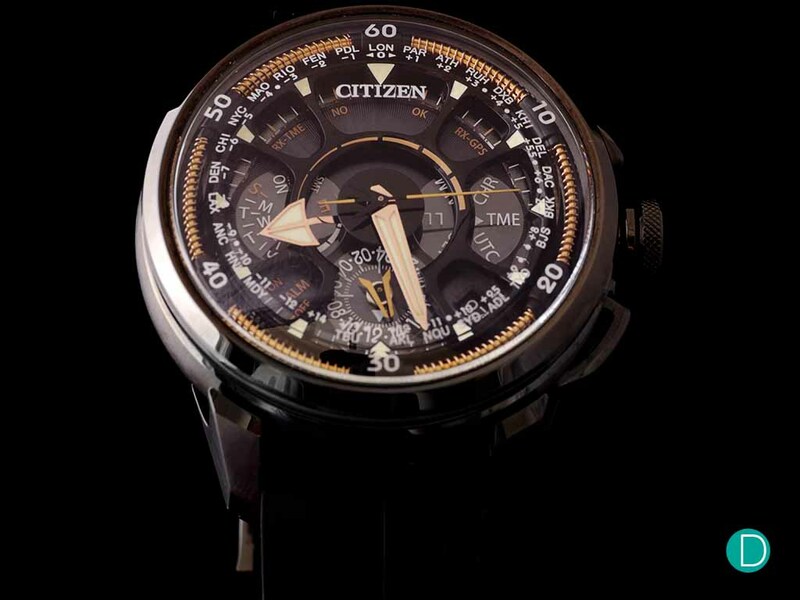 The Citizen logo and some of the dial city markings are transfer printed on the under side of the crystal, giving it the impression of floating over the dial. Rather cool effect. The dial is multi layered, and rather attractive. On the upper level are the hands – the hour, minute and seconds hand. As mentioned, the hour and minute hands are rather massive and distinctively shaped to allow excellent legibility. It is filled with Superluminova, and glows very bright in the dark, though the glow is not very long lasting. A level below is a skeleton like dial frame, below which are three subdials and additional indicators. At 6 is a sub-dial with the second timezone indication which doubles up as the hour and minute counter in chronograph mode. At 4 is a date aperture. At 3 is a sub-dial showing the various modes the watch is capable of – TIME, UTC, SET, LLI, CHR, ALM. And at 9 is a sub-dial showing the day of the week, doubling under certain modes to show show and set daylight savings and power reserve. An arc in the middle is marked to show the light generation levels from 0-5. And additional indicators show when the watch is put into satellite receive mode, and if it has logged in to the GPS signals. The seconds hand is used as an indicator for these functions and is capable of moving very swiftly across the dial. The full functionality of the watch is way too massive for us to cover in this review, and the excellent user manual can be found here. The watch is calibrated for 39 timezones (including half and quarter hour ones), with city codes for 27 of those noted along with +/- UTC timings on the outer periphery of the dial. The main dial shows local time, and the sub-dial at 6 shows home time (or UTC in UTC mode). This can be switched by pressing both pushers simultaneously. On arrival at the destination, the user presses the upper pusher (at 2 o’clock) for 2 seconds. The seconds hand will move to show RX-GPS. This indicates that the watch is trying to receive information from the GPS. Once complete, the time will automatically update to the correct local time, and the seconds hand will return to show the seconds. 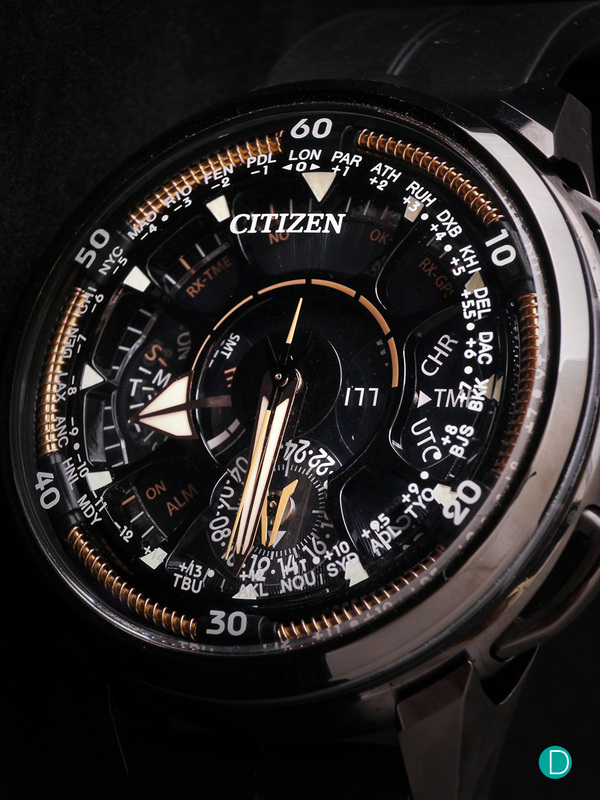 The Citizen F990 uses the satellite information to locate its geographical information to allow it to set to the correct local time. The time it takes to do this ranges from 3 to 30 seconds, and in our experience, it is usually able to complete this task well within 15 seconds. However, to do this, one needs to be outdoor, and the watch dial must face the sky with no blockage. We tried under overcast conditions, with no issues. 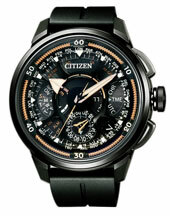 The F990 movement is new, and features the latest Citizen technology. It uses a small, rechargeable lithium ion battery and power reserve is 1.5 years (5 years with power save function). The watch automatically goes to sleep and keeps track of the time, but disables the display when kept in the dark for 3 days. The case has a water resistant rating of 50m. The movement also is a perpetual calendar, programmed to 28 Feb 2100. In our usage, we find no issues with the functionality, or the robustness of the watch, and it performed all the tasks perfectly. The landscape is filled with sports watches which use GPS to track movement and as a secondary result achieve the great timing benefits of the GPS satellite’s atomic clock. None of these display a second timezone, so thus not useful for travel applications. The competitive landscape for more dressy/sporty multi-timezone watches which synchronize with GPS for up to the second accuracy is quite small. In fact, those with all the functions of the Citizen F990 – with chronograph, alarm and perpetual calendar is perhaps only the other Citizen Satellite Wave models. To widen our scope, we relax the specifications to include just the essentials of the GPS satellite accuracy in a two timezone watch. In this wider landscape, we get the Seiko family of Astrons which compare very well. However, the Astrons are only multi timezone watches, and do not feature additional complications (no chronograph, no alarm). We highlight their latest – the Seiko Astron 5X33 GPS (€ 2,200 approx S$ 3,500). Perhaps the closest competitor. It matches the Citizen F990 feature for feature, with the exception that the Seiko does not have a chronograph or alarm. The Astron is also solar powered, is also GPS enabled, and also features a tough titanium case. And accounts for all the current timezones with DST or without, and displays two timezones simultaneously. The biggest difference is that the Astron does not automatically adjust the time to the geographic date it receives from the GPS satellites at the press of a button. It will need the user to set the correct location code to accurately portray local time. More about this competitor in a future article. We have a loaner with us right now as this article goes live. And will do a 1 on 1 comparison between the Satellite Wave and Astron. Stay tuned. 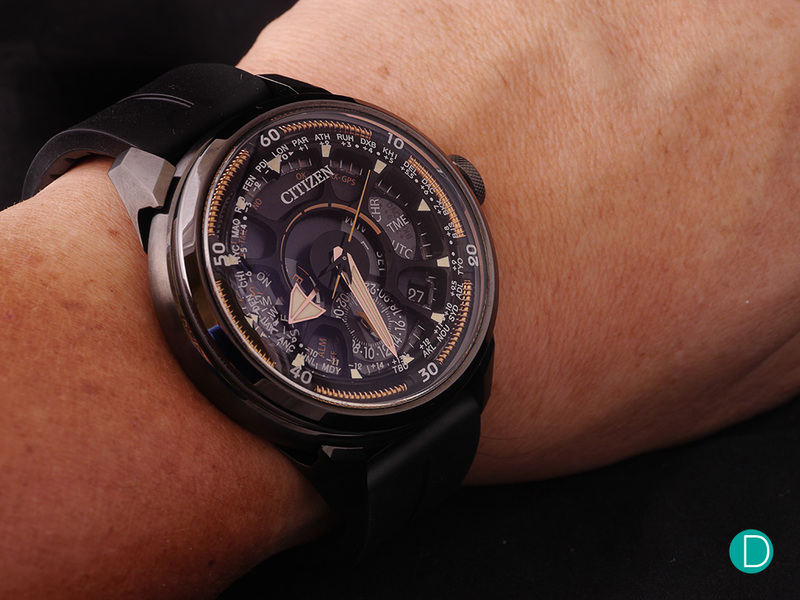 The Citizen F990 Satellite Wave GPS Eco-drive is an amazing watch. The massive size gives it quite a good presence on the wrist, though I must say it still feels very comfortable. The only gripe, is that the rubber strap is rather difficult to put on and remove. The non-buckle side of the strap has a raised edge, making insertion and removal into the buckle difficult. This can be an advantage as well as a disadvantage, as it is definitely more secure and the risk of the strap slipping off is close to non-existant. But it is a hassle to put on and remove. 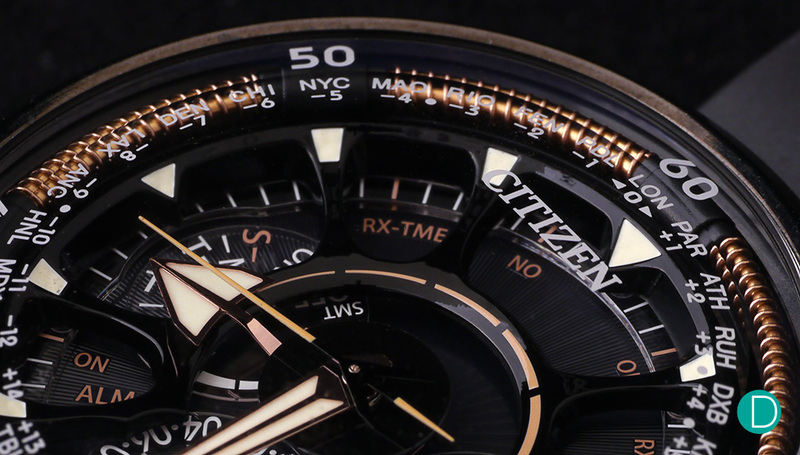 The Citizen F990 Satellite Wave packs a ton of features into the watch. In addition to the dual time and world time functions, it is capable of UTC, and has an easy to use chronograph and alarm system. Whats important is that all these technology work well and work reliably. And more or less intuitively, or at least logically once one have read the manual. In the month or so the watch has been our daily beater, it has proven to be absolutely rugged, reliable, and works superbly. The Duratec titanium case is amazingly tough and apart from finger prints and the like have resisted any scratches. It retains its handsome good looks, we love the black and gold colourways. The watch is accurate, and effortless to use when traveling, and a near perfect travel watch. If only it were a bit smaller…but that’s a nit pick. We highly recommend it!